Just when I was telling myself it's okay to take a day off... Vanessa went and tweeted me this amazeballs ring. 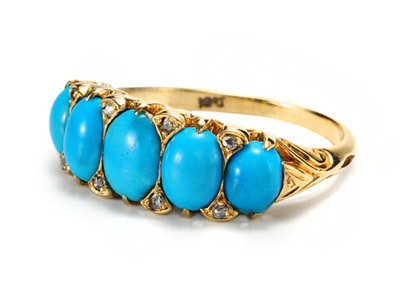 If you guys are so sick of travel guides, maybe I should turn the blog into turquoise ring repository? Just an idea. In this card game of Edwardian poker, five of a kind is a winning hand. A horizontal profile of five (5) natural turquoise stones graduated in size from a central gem are accented by eight (8) tiny rose cut diamonds interspersed north and south between the turquoise. All in a delightful mount of 18k yellow gold with decorated sides. Whatever. LOOK AT THAT RING. p.s. I also dig this lovely little one from Bellflower Bay. No diamonds, one tenth the price. People are dicks. I like the turquoise and the travel. Agreed --- looove that ring! i LOVE the travel guides!!! i keep hoping that someday i'll get to travel and use all these helpful suggestions!! i heart all of your blog entries, esb. for realz. Awesome! My sapphire engagement ring came from The Three Graces. Love them, despite the cheese-tastic jewelry descriptions. I am so not sick of travel guides. Nor turquoise rings. Keep em coming esb. Not sick of travel guides. More please. Man, not mad at the travel guides. Just, like, jump-cut them or something. Those motherfuckers are so long. i keep returning to this comment thread hoping to see a commenters linking to some awesome rings. pick it up ladies! i've been DYING over the mociun turquoise triangle band, and every time i convince myself to bite the bullet she ups the price 25% or more. i refuse to pay a thousand more than the price was when i fell in love with it- gold has not increased that drastically.